Baltic Fleet was ordinary built up by Tsar Peter I during the Northern War of 1700-1721. That time, in 1709, Military and Naval Museum, one of the Russia's oldest museums, was founded by Peter the Great as Model Chamber, where design projects and models of all Russian ships under construction were handed over to. 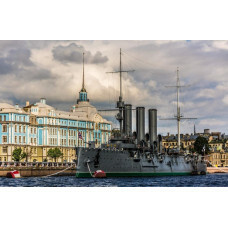 From 1805 the Naval Museum was housed in the Admiralty building, and from 1939-40 - in the former Stock Exchange building at the Spit of Vasilievsky Island. With the collection stock of about 800 exhibits the museum displays a small boat of Peter the Great, about 2,000 ship models, over 7,000 pieces of maritime equipment and armament samples, over 3,500 flags and banners as well as paintings, battle ships and vessels memorabilia, orders and medals, uniforms, photo materials and other items.